This is a very nice hotel, which surpasses itself on location and service. The staff are extremely nice and very attentive and helpful. Nicest hotel staff we have come across. Nothing was too much trouble. The bedrooms are very well serviced, and breakfast is fantastic. Our only slight issue was the pool. When we arrived it was too hot to swim in! Then they turned the temperature down so low, it was freezing and we couldn't swim at all. But we got 2 good days out of it when the temperature was perfect - like a warm bath. We would definitely consider staying here again. 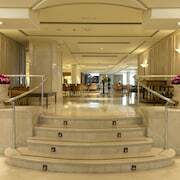 Where to find Province of Seville hotels near an airport? Where can I find hotels in Province of Seville that are near tourist attractions? Seville is a city that satisfies the senses. 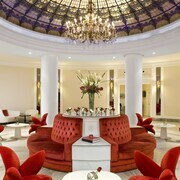 Do you have your heart set on a stay at a Seville luxury hotel? 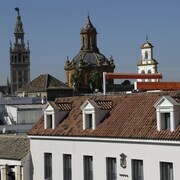 Expedia.ca can serve you great rates on rooms at Seville boutique hotels. We let you browse everything necessary for Seville vacations. You will have plenty of money left over for flamenco lessons and flan when you save big on flights to Seville. 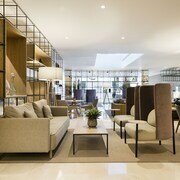 Your search for hotels in Seville, Spain officially starts here. Let us help you stick to your budget so you have money left over for all the great things to do in Seville. Seville is a city that was built through the centuries. 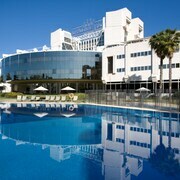 You will get the deal of a lifetime when you book your Seville hotel room using our discount offers. You should definitely consider Seville hotels close to Plaza de España if you want to be in the centre of the city's action during your stay. It is a spectacular spot to select, if you're travelling for your honeymoon because of the custom among local residents to pose for wedding photographs in the stately square. Look for Seville hotels in the district of Macarena, if you want to feast on tapas with the locals. Seek out a Seville hotel near the district of Nervión, if you're in the city on business and you need to stay near all the top corporate buildings. The history buff inside of you will appreciate a stay at a hotel in Triana because of the district's romantic castles and historic churches. The Barrio de Santa Cruz is one of the best areas to look for hotels in Seville. Residents of the city love to gather in this neighborhood of narrow streets, lively restaurants, and hidden patio gardens. Tourists flock here for the friendly energy. You will be able to exit your hotel every morning to visit galleries and shops. Don't be surprised, if you find yourself tempted to pluck a ripe orange from one of the many trees that line the streets in the Barrio de Santa Cruz. You'll need the nourishment of more than just fresh oranges, if you intend to keep up with the vibrant flamenco dancing and cocktail drinking that goes on in the neighborhood after dark. Booking your trip to Seville has never been simpler. Expedia.ca always gets you a great rate on what you need to plan your vacation. We can also show you great prices on car rentals in Seville. Book your tickets today for some serious fun in the Seville. 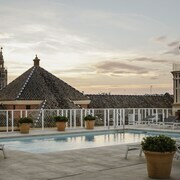 What are the most popular Province of Seville hotels? Are there hotels in other cities near Province of Seville? 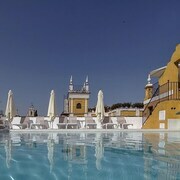 What other types of accommodations are available in Province of Seville? Explore Province of Seville with Expedia.ca’s Travel Guides to find the best flights, cars, holiday packages and more!